My first Caesar salad was almost 10 years ago, when Webster took me to meet some of his old friends in Virginia Beach, VA. We visited with this couple for a little while and then he took me to the Isle of Capri, a hotel rooftop restaurant overlooking the beach. It was Fall, the wind was quite sharp and the beach was deserted. He suggested the she-crab soup and the Caesar salad. 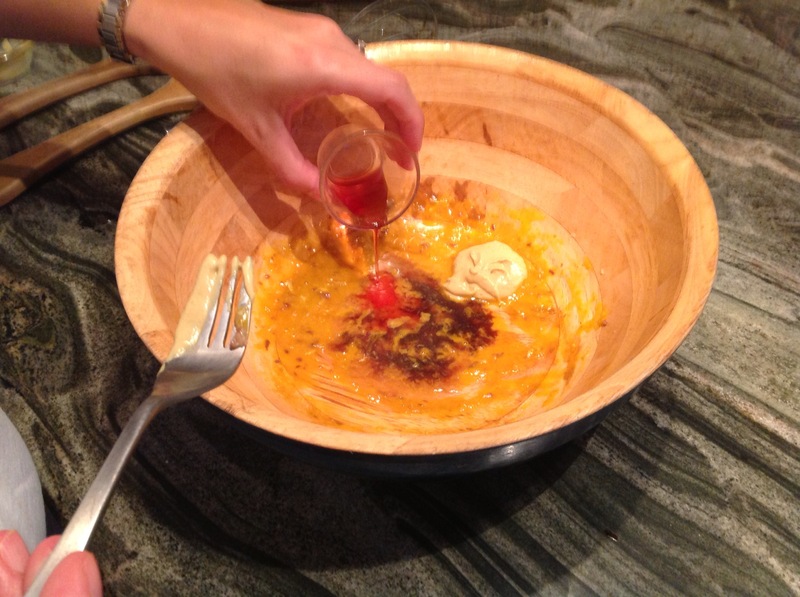 And a table-side demonstration is what we enjoyed that night at the restaurant. The maitre ‘d wheeled a cart laden with ingredients to the table and began the process of creating a magnificent salad. The performance only enhanced the taste! A few weeks later we were in New York City, wandering around midtown. I was starving. Webster suggested Il Menestrello, a small Italian place on East 50th St. It was mid-afternoon and we were nearly the only ones there. Again, the maitre ‘d wheeled a cart up to our table and proceeded to perform a ritual I have come to love. Two hours, a bottle of wine and some fabulous pasta later and I knew I was falling in love – with Webster as well as with Caesar! Thank goodness the salad was prepared before the bottle of wine was consumed for my mission, upon seeing that cart being wheeled to our table, was to capture every morsel of preparation technique and return home with the ability to recreate that masterpiece of gastronomic excellence in the comfort of our own home. 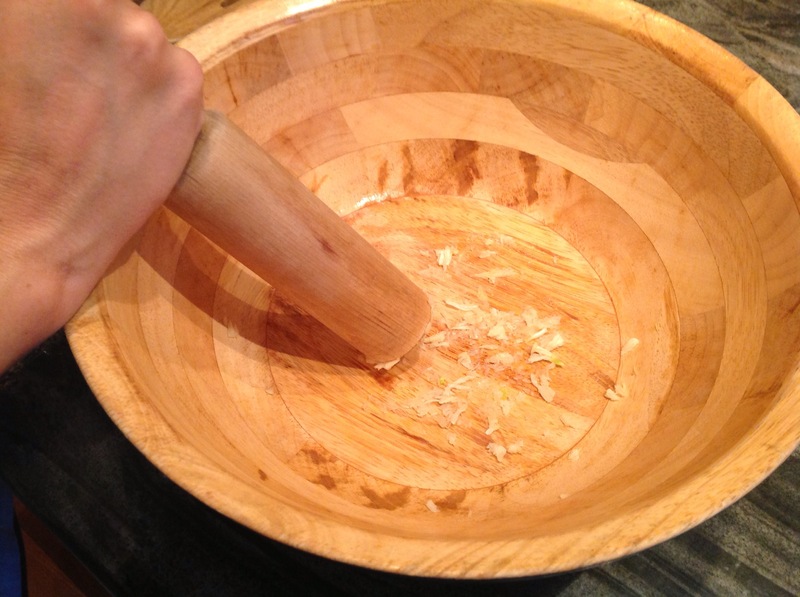 So, I watched as our attendant pounded the garlic into the heavy wooden bowl. I salivated as he crushed the anchovies and mixed them into the garlic mash and when he noticed my eyes straining and my neck craning to examine the next step, he promptly explained that by pulverizing the garlic and the anchovies into the wooden bowl, the oils were embedded into the bowl and it delivered a depth of flavor that no material, other than wood, could deliver. It seemed he knew he was educating me and was happy to do so. He completed his course of study with me and I left that afternoon with a great desire to make our maitre ‘d proud for years to come. Give a girl a Caesar salad and she will eat for the day but teach a girl to make that Caesar salad and the world will eat for years to come. So, go make our maitre ‘d proud! 1. 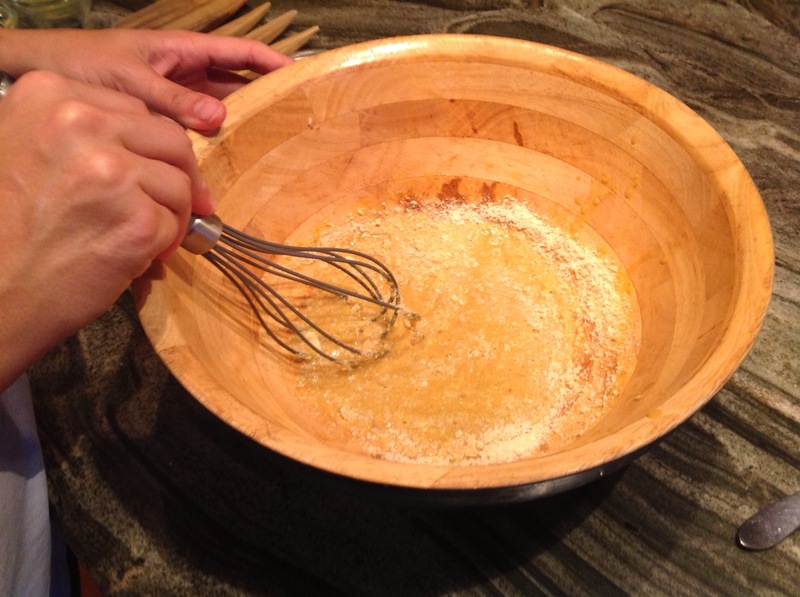 Place the Garlic in a large wooden bowl. 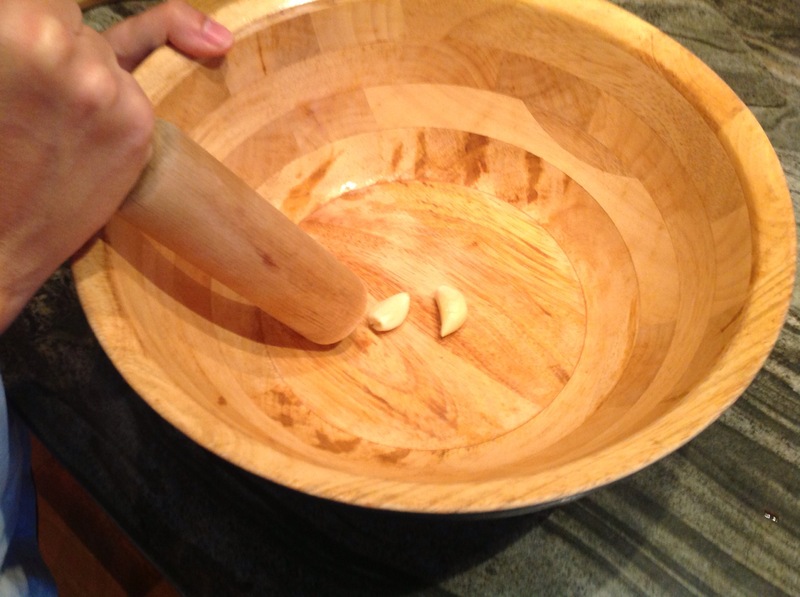 With a muddler, pound the garlic into the bottom of the bowl. 2. 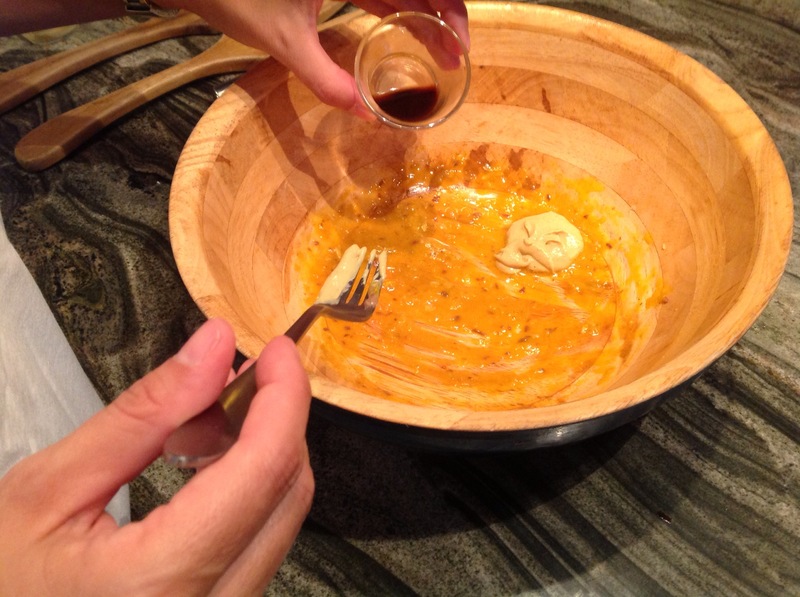 Add the anchovies to the bowl with the garlic and pound the anchovies into the garlic with your muddler until a paste is formed. 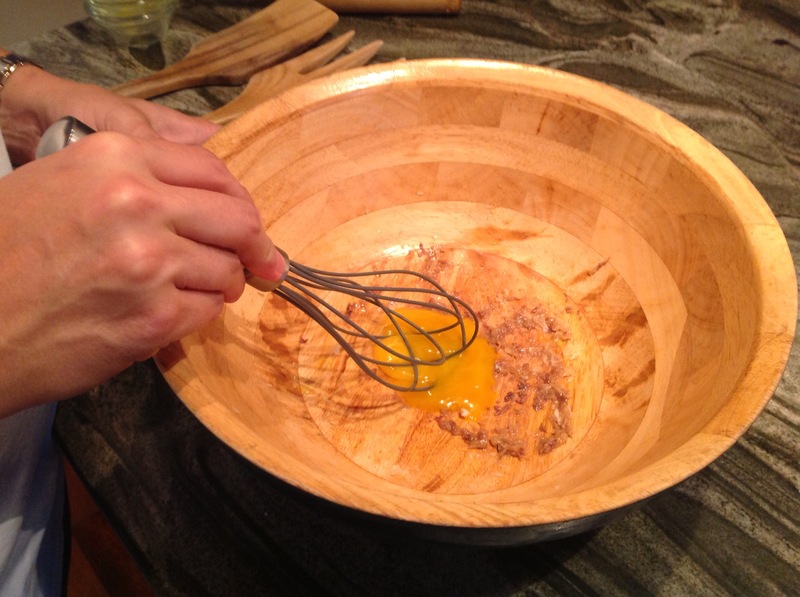 Then drop the egg yolk on top of the paste and whisk to combine. 3. Now it’s time to spice things up a bit. 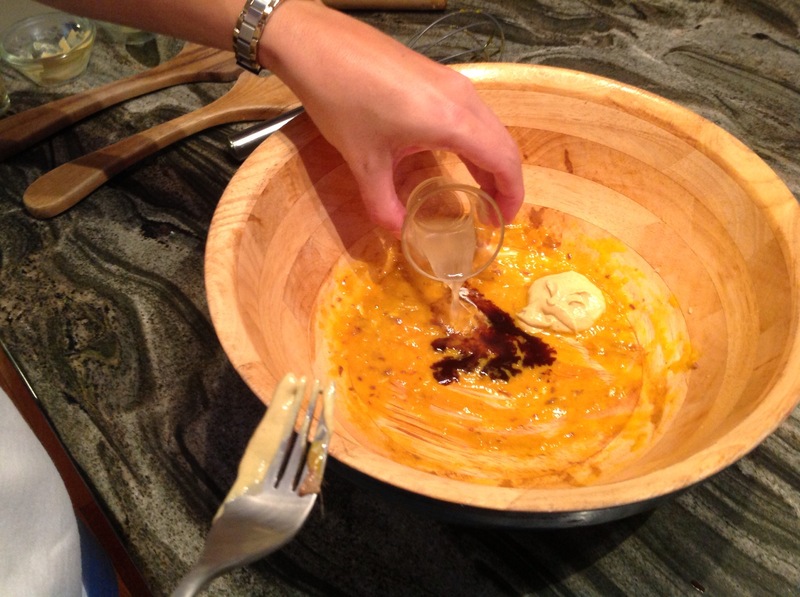 So, let’s add the dijon mustard, the Worcestershire sauce, the lemon juice and the red wine vinegar. 5. 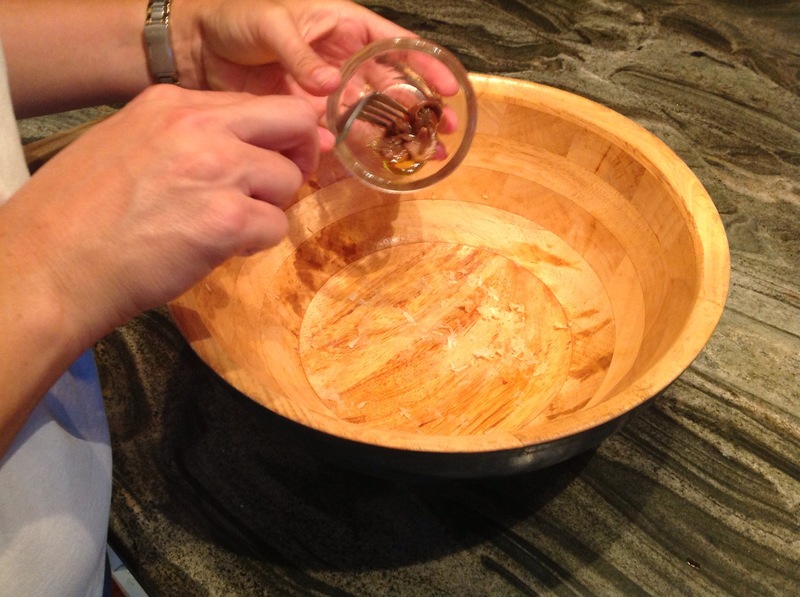 As we prepare to introduce the main ingredient, extra virgin olive oil, keep in mind…slow and steady stream. 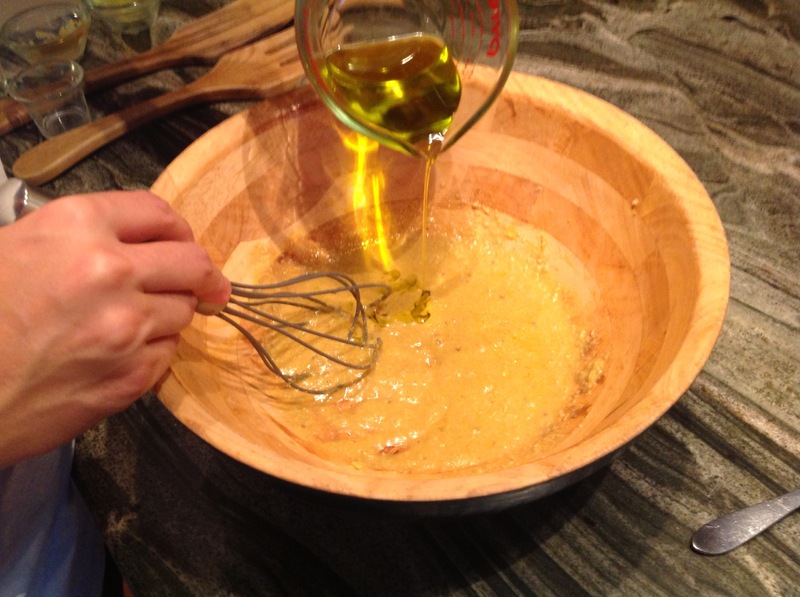 So, as you continue to whisk, sloooowly add the olive oil. 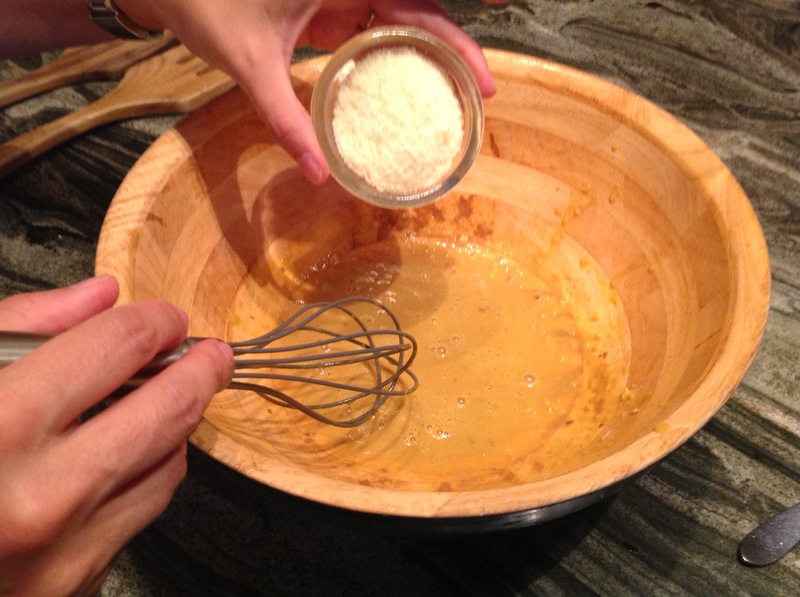 Not to be repetitive, but slow pour and steady whisk. 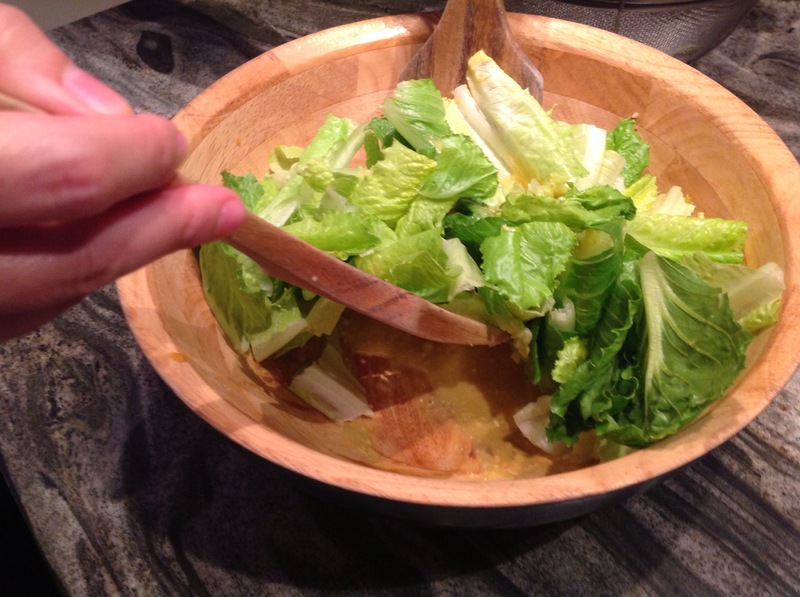 This creates that luscious creaminess that makes this salad a true Caesar! 6. Your dressing is complete and now for the grand finale…drum roll, please! 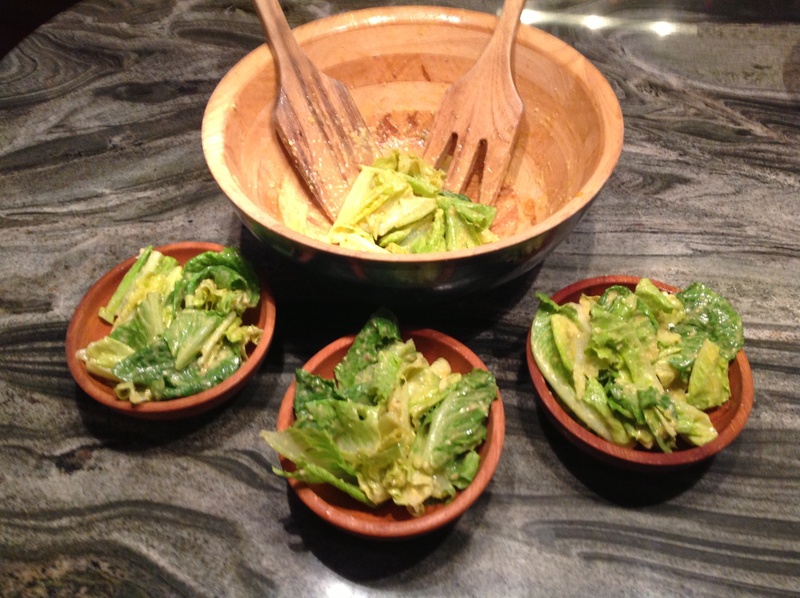 Introduce your crisp Romaine lettuce to your creamy concoction and toss about with salad tongs. 7. At this point, you can serve your salad as it is or you may choose to add a few croutons and maybe some crispy chopped bacon. In the past, I have topped my salad with single fried oysters or fried shrimp or pan seared scallops. If you choose to use it as a side dish, it pairs nicely with any Italian entree and we have found it to be quite a compliment to crab cakes or oyster stew. This time we opted for the simple Caesar salad. 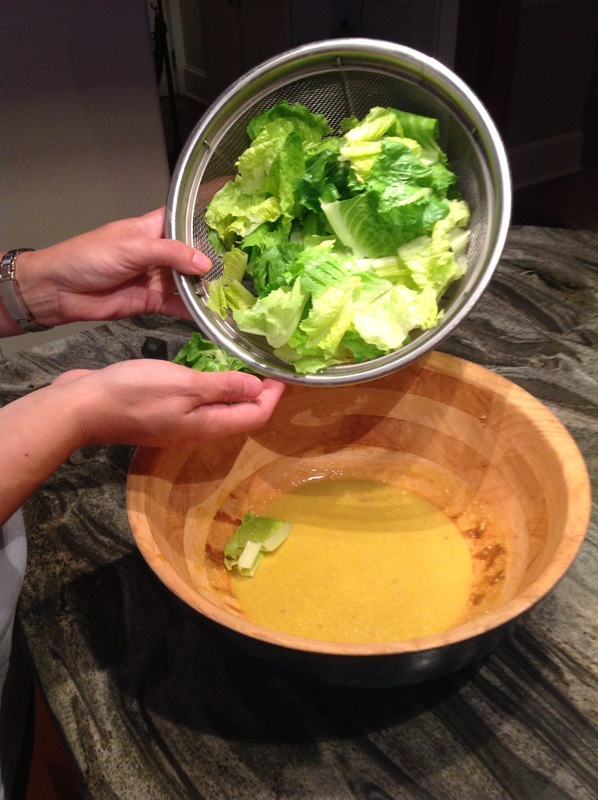 So, if my Salad Professor aka Maitre ‘D is tuning in to this post…I hope I’ve made you proud! 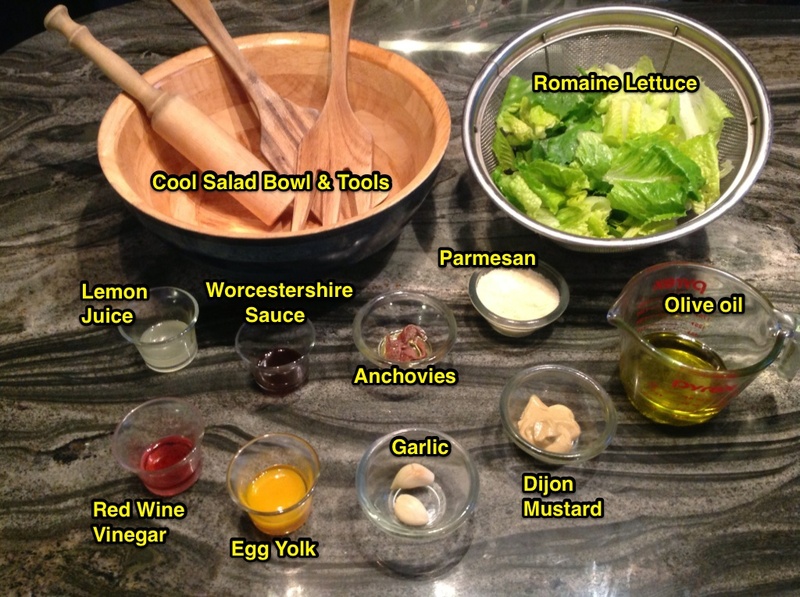 This entry was posted in Salads, Side Dishes, Uncategorized and tagged Caesar Cardini, Caesar salad, Salad, side dishes. Bookmark the permalink. Unable to locate a muddler in our kitchen (or anywhere else in our 10 X 50) we thought we were up the creek, but before feeding the lettuce to the pigs we picked up and old 16 oz. framing hammer and gave it a try. Smashed the bowl to bits, but did a job on the garlic. You may want to pass on this suggestion to your readers. Ummy! I can attest to this being delicious. The Matriarch. Good reviews – especially from The Matriarch – are VERY important in the life of a blog!